An important alert was going out to Baltimore County residents on Wednesday. 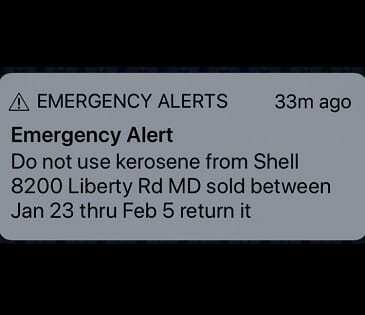 Baltimore County Fire Department officials have been notified that kerosene contaminated with gasoline was sold between January 23 and February 5 at the Shell station and Dash-In at 8200 on Liberty Road (21244). The warning prompted an emergency alert on the cell phones of Baltimore-area residents. Use of this contaminated kerosene poses an imminent fire risk if used in kerosene-fueled devices, such as space heaters. Customers who purchased kerosene at this gas station between January 23 and February 5 should not use this product. Use of gasoline in equipment designed for kerosene is known to cause fire and other hazards, fire officials said. Dash-In’s parent company this morning advised customers to return the product to the Shell station at 8200 Liberty Road. 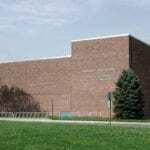 “We recently learned that the clear kerosene product purchased between Wednesday, January 23 and Tuesday, February 5 at the Dash-In location at 8200 Liberty Rd., Baltimore, MD may be contaminated. “If you are one of the approximately 46 customers who purchased clear kerosene from the location between Wednesday, January 23 and Tuesday, February 5, do not use the kerosene product or any remaining stored kerosene product as it is a fire hazard.